Free CE classes. 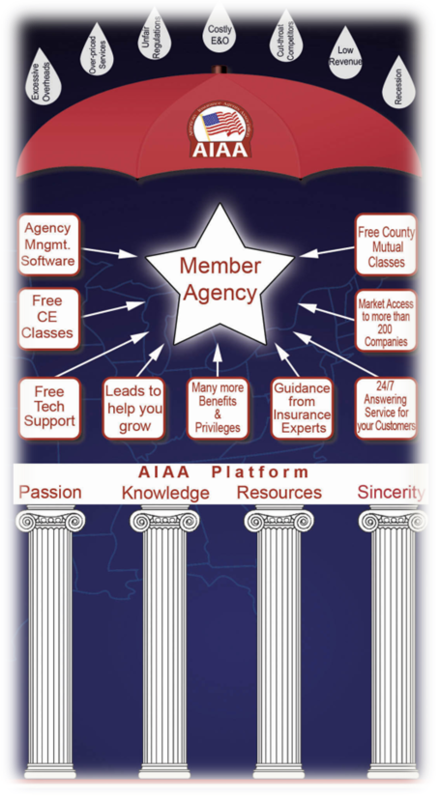 AIAA gives absolutely Free CE courses to its members. Daily Text Messages to Your Customers for Birthday Wishes, Reminders, & More. Renewal Reminders & Cancellation Notices to Your Customers. 24/7 Answering Service for Your Agency Customers. Virtual Agent in Your office. Merchant Services & Credit/Debit card opportunities. Savings on Your E&O premium. Special Group Health rates for You & Your family. Cyberspace, Electronic, Broadcast & Print Media Marketing. Agency Accounting & Tax Services. County Mutual Classes for your employees. Human Resources assistance. AIAA provides Human Resources service to its members. Dinner/Lunch Meetings for Industry Networking. Write business out of your State. Assistance & Guidance from Insurance Experts. Free banners, blimps, flags, tents, balloons and other advertising & promotional materials. Post cards, Calendars, Brochures and more for your Agency Ads/Promotion. Data Entries, Documentation, Paperless Filings & Uploads Assistance. Assistance in getting Direct Appointments by Carriers. Assistance with Equipment Financing matters. Pay Online Software for YOUR customers.